I have really been curious about the work of New York designer Ashley Whittaker, who was named one of the Domino 10 in 2007. I could tell from the photo of her apartment that her look was tailored and traditional- but with a twist. She incorporated just enough color and pattern (and fun accessories) to make her home au courant, but she managed to maintain a classic rather than trendy look. I think that this was the hook for me! Fortunately, we can see more of her work in the February issue of House Beautiful. The house, located in Southampton, is yet again a striking mix of color and pattern. The furniture consists of many timeless pieces, but the boring is banished with Whittaker's use of playful prints. I think my favorite room is the dining room- I love the turquoise fabric on the walls combined with the pink/coral fabric on the chairs. And, as Whittaker is a former protege of Markham Roberts, I think you can see a bit of his influence in her work, but the look is wholly Whittaker. 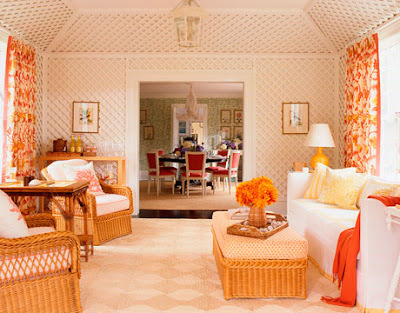 The cheery sunroom with lattice, wicker, and various fabrics in orange! The use of blue in this sitting room inspired the use of it throughout the house. I like the various shades of blue- from ice blue to turquoise to navy. A very feminine and cozy bedroom-I love that Cowtan & Tout print on the vanity skirt and the pillows. Top images: Views of the dining room. 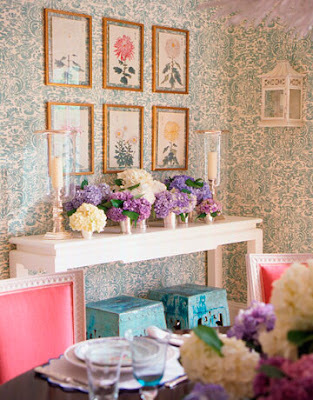 The turquoise linen on the walls is from Quadrille; the coral linen fabric on the chairs is by Travers. The Nairobi fabric is fabulous. I have also had my eye on her since the Domino. 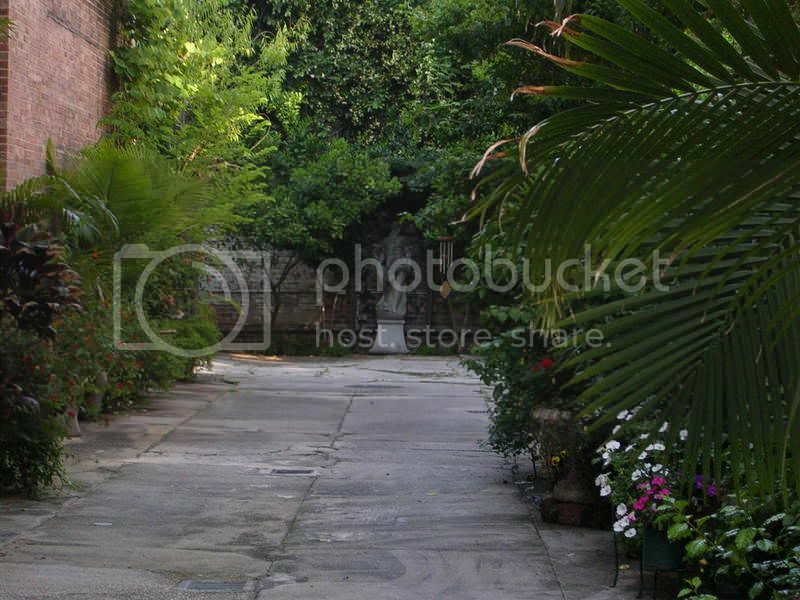 I am in love with this house! Bravo. I love, love, love these rooms. As a Southerner and someone with a lot of antiques that I have to work with, I am really drawn to traditional with a little twist. Thanks for the beauties! Thanks for all of the great photos, info.and link to House Beautiful's feature on her work. You have done a wonderful job, as usual! Wow! So glad you all think as much of her as I do! Any idea what the curtain fabric in the living room is? Anon- According to the mag, it's Granada in Robins Egg by AM Collections. I like it! Mackenna- That's a good one! I also like those lanterns in the dining room- Charles Edwards. Kelly- I love that trellis too! It makes the room. Where did she work before Markham Roberts? Do we know? She is very talented. I do love his work also - so makes sense I was drawn to her aesthetic. Caroline- I'm not so sure. I'm with you about liking Markham too! Beautiful work, the sunroom is my favourite. Thanks for sharing these photos Jennifer, I've been curious about her work as well. 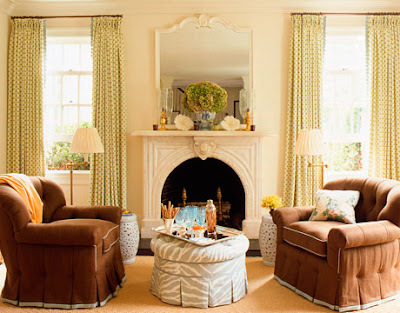 These designs are so fresh and that ottoman upholstered in Nairobi if fantastic! These pictures keep my hope and dreams alive for sure. What inspiration! WOW! What an incredible house. Whittaker has such a good eye and fantastic style. I can't wait to see more of her work-- it is a real treat. Me too- can't wait to see more of her work! Love all these rooms -- he design work is beautiful. I'd love to know where you might be able to find the ottoman in the blue family room... I've been searching for a table top ottoman like this one! Anon- I've seen some similar at fabric stores- you can either buy fabric from them or use your own. I know that in Atlanta they have them at Lewis & Sheron (lsfabrics.com). What an incredible collection! I especially like the blue sitting room and the 2nd photo of which Anne did the painting of! Thank you for introducing! Does anyone know where to find the chinese console in the dining room? thanks.